Mine spokesperson James Wellsted said five other mine workers were admitted to hospital and are in a stable condition. Wellsted said six other mine workers were still trapped underground. "We have located three of the six workers, but the other three are still uncounted for." On Thursday, the mine said a seismic event, which occurred at about 13:30, caused a fall of ground in an operating stope. Mine rescue teams were immediately mobilised and three workers were located and were interacting with the rescue teams. Earlier this year, 955 miners were trapped following an electric cable outage at the Sibanye Gold mine in Welkom. 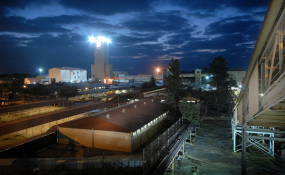 A week later at the Kloof Ikamva shaft, two mine workers were found dead after a fall of ground caused by a seismic event. The following week a mine worker died at the Sibanye-Stillwater's Masakhane shaft when a box of gold ore crushed him to death.